It is often necessary to measure a force or weight (in tension or compression) over a very small range but to a high accuracy. 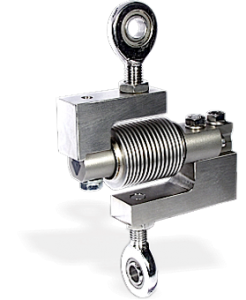 For larger capacity ranges of say 100 kg or more, special S type load cells have been developed where the load is introduced through threaded holes top and bottom and forces can be applied in either tension or compression. The ZV-355 has been designed to allow the load cell 355 to be used in this type of application but where the capacity range is much lower. The two stainless steel L blocks are attached to the standard 355 load cell via the mounting screws converting it into a S type style of load cell. The L blocks are designed such that the line of the load is directly through the threaded holes in the blocks. The ensure highly repeatable results from the load cell. This type of assembly is often used in the conversion of analogue hybrid mechanical scales to digital versions where there is a high resolution required over a small measurement range.